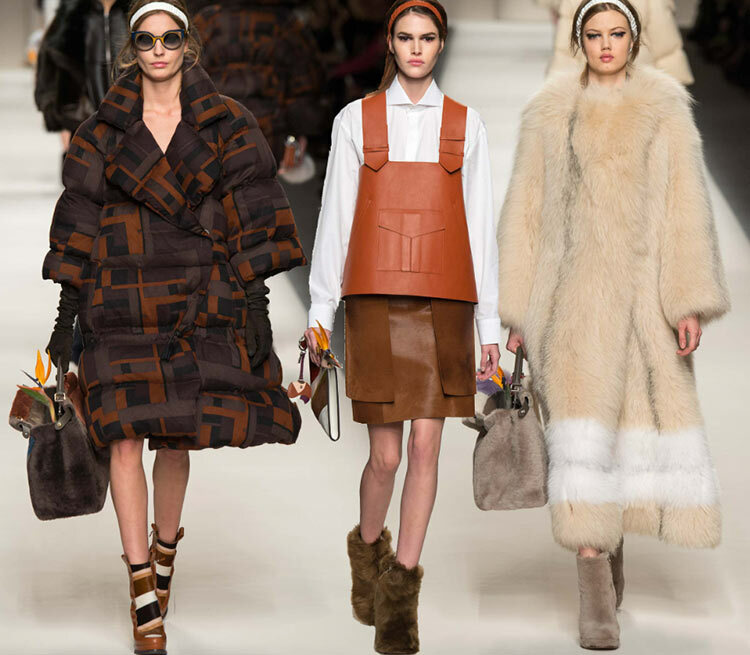 You either go Seventies or Sixties this upcoming fall season, however, when it’s a Fendi design it’s always something more than the ordinary vintage style. 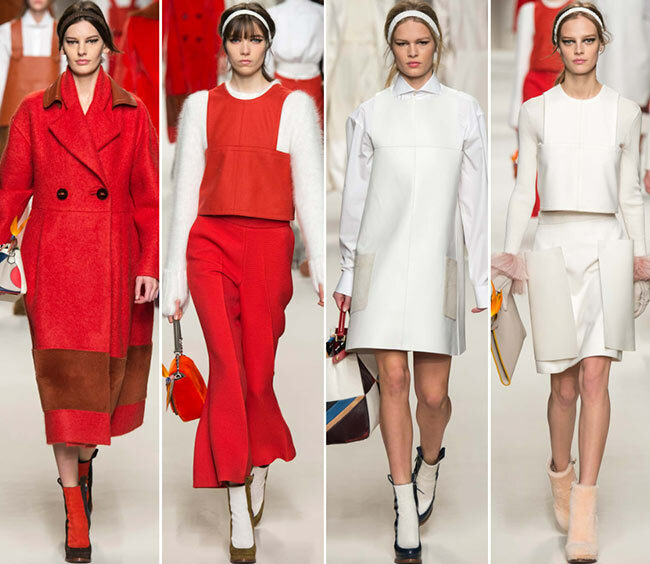 Inspired by the famous movie The Royal Tenenbaums, creative director Karl Lagerfeld sent out his Fendi fall/winter 2015-2016 collection at Milan Fashion Week this afternoon wowing with his Sixties references spiced up with a big dose of modern allure. It has a typical futuristic style about it, something that Mr. Lagerfeld has us gotten used to when seeing a new Fendi collection. Fusing that with big proportions of glamour exercised through the usage of the Italian fashion house’s iconic luxurious fur and leather, as well as exquisite designs with great attention to the cuts, shapes and small details, he managed to make our hearts melt at the sight of each and every look showcased. 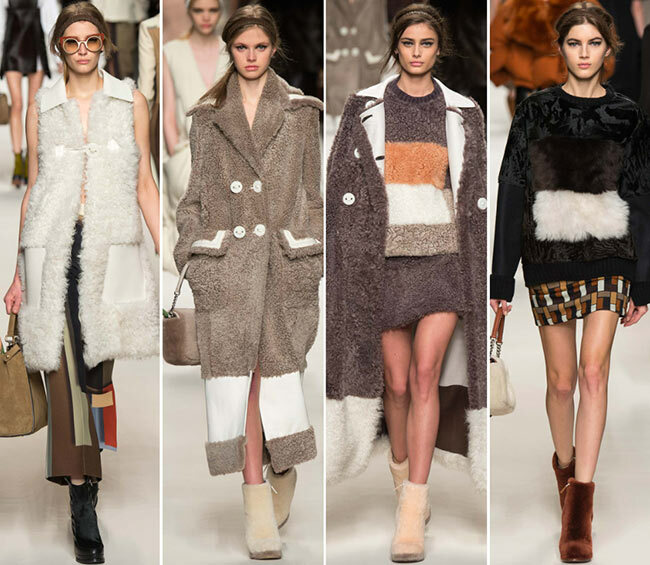 The Fendi fall/winter 2015-2016 collection is utterly warm and cozy, which never deprives it from being uber luxurious, elegant and feminine. Whether it’s about the outerwear or the pretty dresses presented, diversity in shades, shapes and devastatingly beautiful details makes the entire collection the go-to destination for updating your entire wardrobe according to the latest trends. Playing with geometric constructions and big volumes, the Fendi woman looks creative, fun and just drop-dead gorgeous this fall. She’s not afraid to experiment with innovative styles and eye-catching details and she’s the one trendsetter, who walks to the street in pretty straight pinafore dresses, leather skirts with imaginative apron-resembling pockets and amazing oversized outerwear that places the focus on the lavish volume, the beautiful colors and the game-changing details. She parties in a fluffy strapless fur mini dress to feel warm and sassy at the same time, and, of source, she pays much attention to the footwear she wears and the handbags she carries. 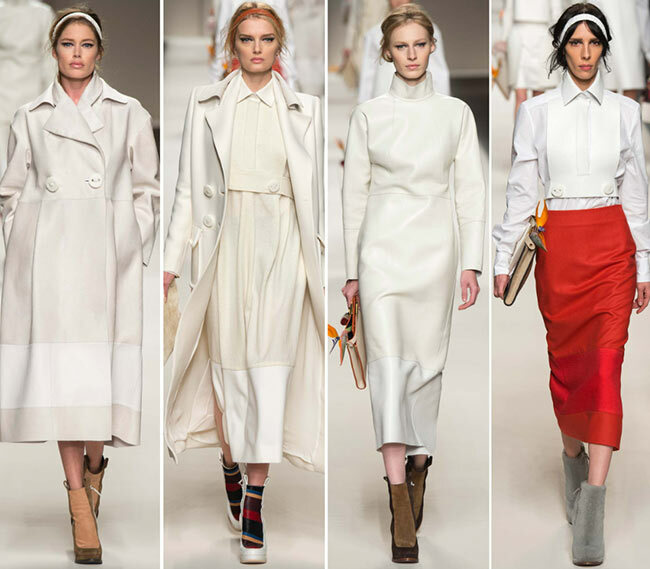 Color wise, we see an abundance of timeless whites mixed and matched with creams and chestnut browns, at times interrupted with camels, blacks, beiges, grays and burnt orange-reds. While the majority of the looks center around monochrome pieces, we see a wonderful game of color blocking and geometric patterns as well that takes the entire array of modernized and geometric structures to a whole new level. 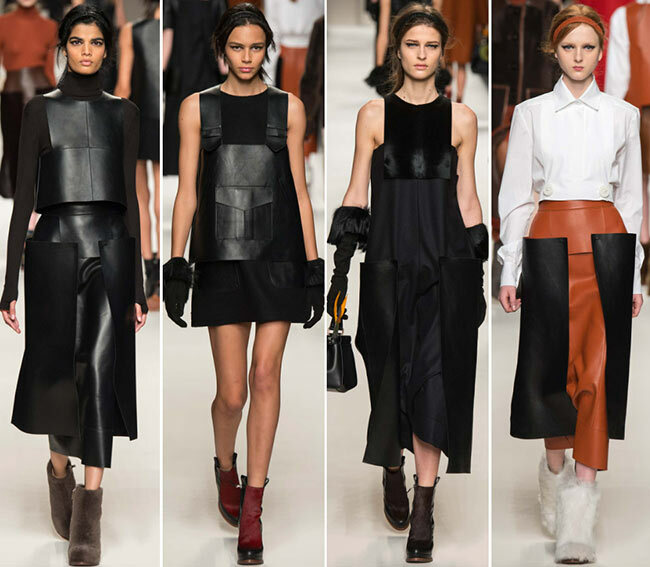 Details play an important role throughout the collection, as we see interesting oversized side pocket resembling appliqués on the tea-length leather dresses and apron-style big front pockets, which act as the focal points of almost every design presented, be that a skirt, a top or an outerwear piece. The breathtaking combinations of contrasting textures and materials make us swoon instantly, especially when we are treated to big proportions of fur, leather and mohair that add to the comfort and warmth of the looks. While those futuristic skirt and top combinations and pretty dresses are what we all need to look chic and unique at various occasions, the outerwear unveiled plays an important role when it comes to bundling up in style and finishing off our winter-ready outfits with luxurious details. 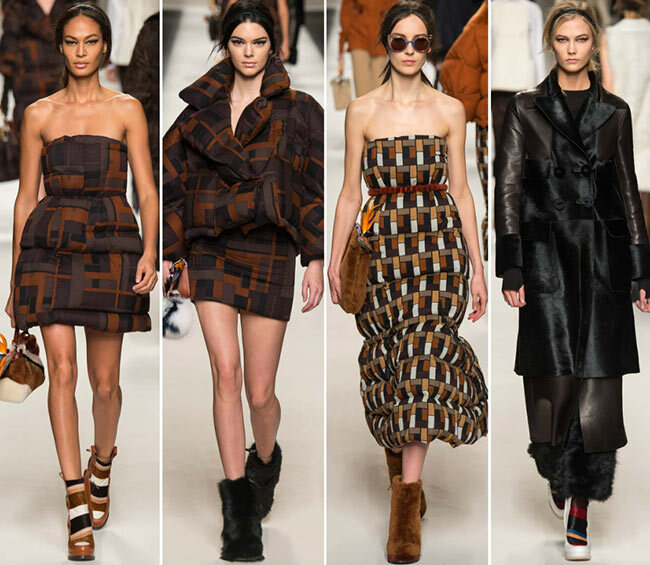 We have oversized and elongated coats with patchwork panels put in the shades of beige, chocolate and black, as well as shaggy and luxe fur coats ready to inject a touch of opulence to your day-to-day and elegant looks. 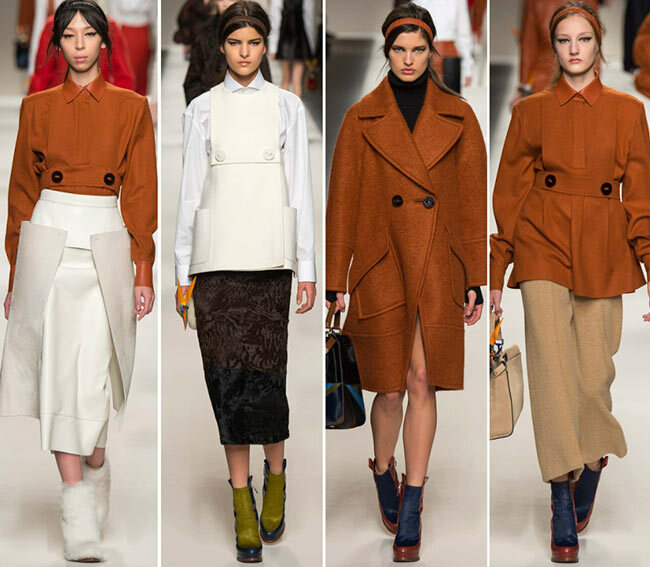 Some of the mini-length coats are cool enough to wear on our naked bodies as winter dresses, while the color-blocked trenches can top off almost every type of look, be that an office-ready one or a party dress. 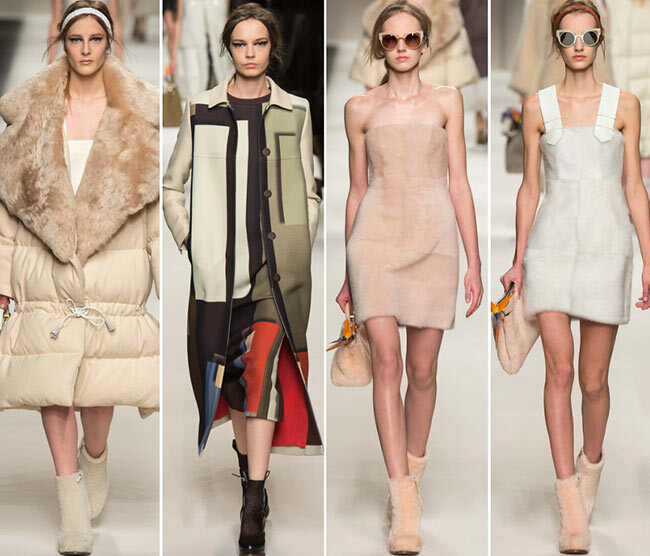 The quilted puffa jackets look absolutely insane coming super-big and cool and transforming into a strapless cocktail dress with a deep V-neck and oversized side pockets. When it’s a Fendi collection you can hardly go without creative details and accessories and they never lacked on today’s runway either. 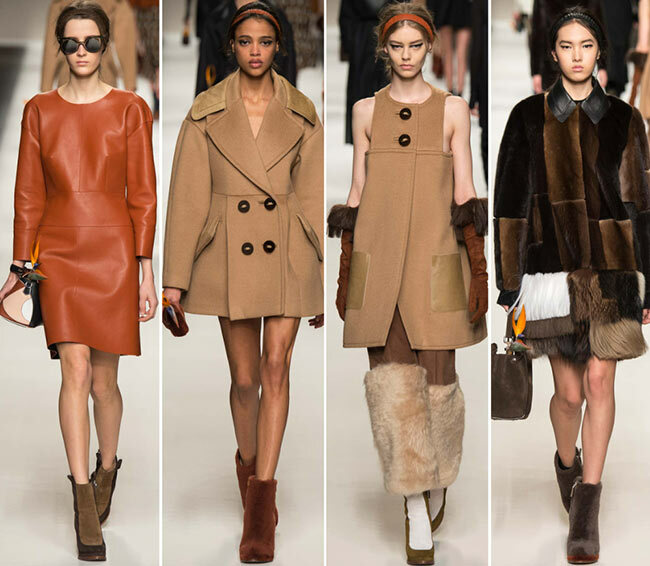 The fur ankle boots and the leather wedge booties with color-blocking touches look absolutely cool in combination with all the outfits presented, as well as with the oversized Fendi handbags or the tiny purses and clutches featuring the iconic Karlito adornment or a colorful bird of paradise detail. 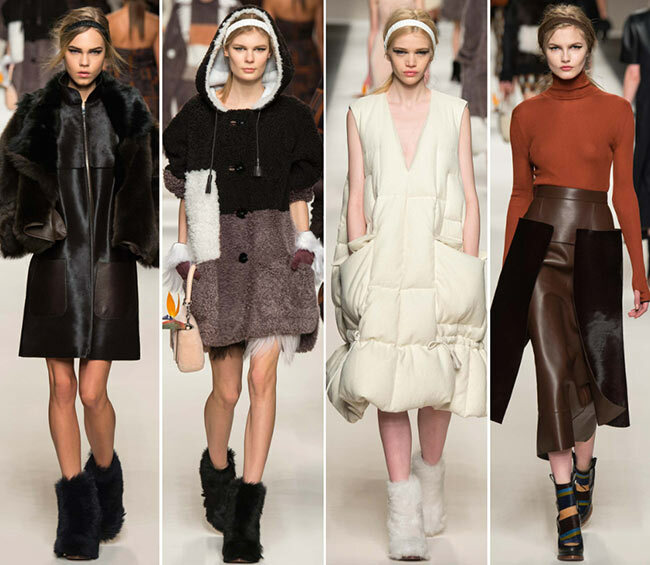 As a final touch, the models wore leather headbands to pull back the textured and teased hair, as well as elbow-length suede gloves with lots of fringing for added warmth and luxury. Wholly, we are in love with every single detail and design we saw today at the Fendi fall/winter 2015-2016 collection presentation! Can we please have it all right away?